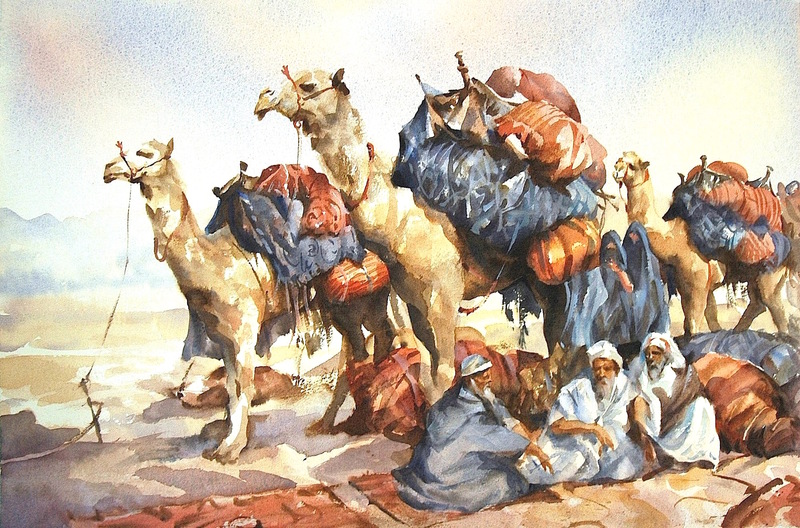 Conversation is a fine watercolour showing a group of older men or elders in discussion at a place of rest with a further group of bedouin women in the background probably eavesdropping on the conversation. Blues and reds predominate in this luxurious Oriental watercolour by Trevor. Delicate washes of colour describe the backdrop of desert, mountains and sand moving gradually to the foreground where there are carpets laid out for the figures to take their rest upon. The whole scene describes an intimate look at what takes place in a brief sojourn at a bedouin resting place, making this work of art a classic of storytelling.